Pre-heat oven to 150°C/300°F (convection). Crumble cookies or whizz them through a blender. Choose cookies by personal preference. I normally use butter or caramel cookies. Combine cookie crumbs with sugar and butter. The sugar can be left out. Grease a springform pan and press down the cookie mixture. This will be the cake base. Go up the sides as well. Combine cream cheese, sour cream, sugar, and the seeds of the vanilla bean. Stir in eggs one at a time. Add flour and milk and mix well. Pour into the springform pan and level out. Bake at 150°C/300°F (convection) for approx. 1 hr. Leave cake in oven to cool down (with oven door open). 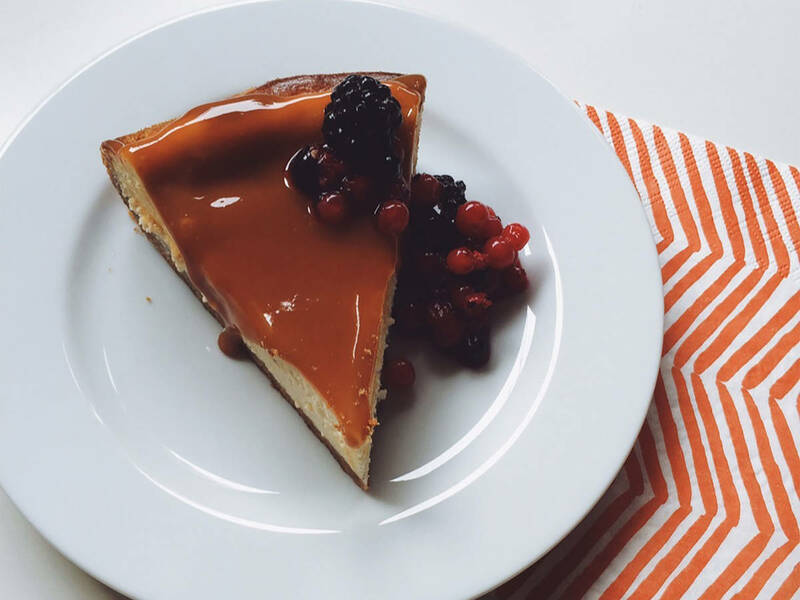 When the cake has cooled down, add a topping of your choice, like caramel sauce, sour cream, or chocolate ganache. Serve with berries.